The Ring Floodlight Cam featured in the video above illustrates how effectively you can create a "protective zone" at your place, for very little money. If you really don't need or want a full-service, dedicated home security system, there are plenty of individual or what we call "modular" devices that permit you to secure and monitor your home from anywhere, simply via a mobile device and an Internet security camera. You can pick and choose which of these modular devices best suit your needs, cafeteria style. Choices include indoor and outdoor security cameras, video doorbells, garage door openers and smart door locks. All explained below. A modular security system of this type does not have a central Control Panel inside your home, like dedicated Security Systems do. Instead, your various devices are controlled with apps loaded into your smartphone. Your mobile phone or tablet acts as "Command Central" for your custom-built home security system. You can arm and disarm a system, add and delete components, and receive push notifications when alarms are triggered. Most apps also allow you to view live and recorded video, lock and unlock doors, and set off or silence loud warning sirens. Many of the DIY home security devices integrate with Amazon Alexa, Google Assistant, Nest and/or IFTTT. Read all the fine print, as features vary widely with different brands and models. "IF This Then That", also known as IFTTT, is a free web-based service (also runs on iOS and Android platforms) from which you can create chains of simple cause and effect commands, called applets. Web-based applet example: IF THIS (someone tweets using a hashtag) THEN THAT (send an email). IF THIS (I open the garage door) THEN THAT (the floodlight turns on). IF THIS (the smoke detector goes off) THEN THAT (the doors unlock). IF THIS (the window sensor is triggered) THEN THAT (the inside camera starts recording). And what is Push Notification? 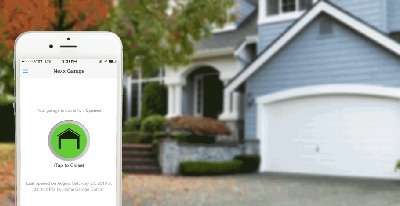 A push notification is a text message that is sent to your mobile device (iOs or Android) alerting you to an "event" that is occurring with one of your home network devices. An example would be a message informing you that your Smart Door Lock was unlocked. Almost all modern Smart Home security devices will give you Push Notifications. A few also send web-based notifications (Email). Once the Smart Home Network link is set up, you do not have to be within range of your home's Wi-fi in order to communicate with your Smart Home devices by phone; you can be many miles away. The most popular first line of defense for folks not interested in installing a dedicated security system is a surveillance camera. This is a great way to keep tabs on your place, whether you are home or not. If you only get one camera, position it to monitor your main entry point (the front door). 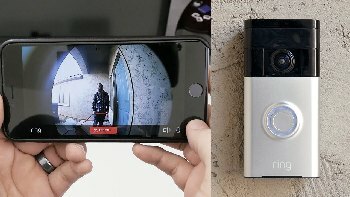 Most standalone security cameras connect to your home's Wi-fi network. This means you can see what the camera sees, right on your mobile phone, even if you are thousands of miles from home. Most of these cameras have motion detectors that trigger the camera to start viewing and recording the scene. They also send push messages to alert you that something is going on that needs to be investigated. An outdoor security camera is waterproof and made to withstand the elements. Some are hardwired into your home electricity, limiting placement to where wires can be run. Others are powered by batteries, which gives you much more latitude in locating them (even in trees!). Indoor surveillance cameras can record activity that takes place inside the home, whether you are asleep upstairs, or at work. Some inside cameras are in plain sight and can record what pets are up to, when children get home from school and anything else that motion-triggers recording. There are even subtle/hidden spy-cams, or nanny cams, to conduct secret surveillance when needed. Just make sure you really want to know what goes on while Mom's at work before setting one of these up! So what exactly is a Video Doorbell? The camera lens is front and center at the door, often giving you a more clear and distinct picture of the visitor's face. It's hooked up to the doorbell! Although this devices senses and reacts to just motion in the area, the act of ringing the bell always triggers the live video stream and push notification to your phone. Smart video doorbells allow 2-way communication with the visitor, even remotely via mobile. He thinks you are just inside the door; you are really 20 miles away! Watch the video below to see how this homeowner greeted the UPS man and had him safely store his package in the garage, all while he was not even home. This was possible through the use of a remote-controlled video doorbell and garage door opener. Although that is the only equipment you would need to pull this off, this guy also has some extra auxillary cameras at the front door and inside the garage. The technology available today is simply amazing! Some video doorbells can be wired directly into your existing wiring (replaces existing doorbell); others run off rechargeable batteries. Helpful features include wide angle lens (140 to 180 degrees) and night vision. 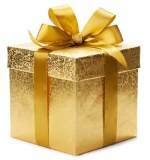 Some companies require a modest fee for cloud storage; Ring charges $3 per month for access to your video recordings. Another cool feature is support for Alexa Echo device that lets you view a live stream from your front doorstep on your Alexa Echo Show or Amazon Fire-equipped TV. "Alexa, show me the front door on my TV". The Ring Floodlight Cam has this capability. A Smart front door lock is often included in a dedicated home security system, but it can also be used in conjunction with a video doorbell for a formidable entry barrier, or even as a standalone security device. You can get a smart lock that integrates with your Smart Home automation hub, like Google Home or Alexa Echo. 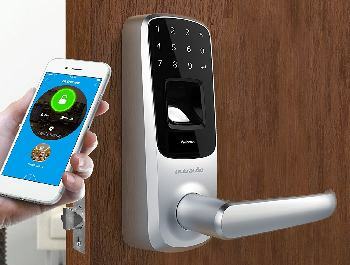 If you aren't into the "Smart Home realm", at least get a smart lock that connects via Wi-fi or Bluetooth so you can control the lock remotely (via cell phone app), and receive "push alerts" whenever it is locked or unlocked. Most Smart Locks are designed to fit in standard door holes and are therefore fairly easy to change out with basic DIY skills. Some models don't require removal of your existing door knob, but attach to the inside of the door. Read all the fine print so you know what kind of a project you are getting into. Some features to look for in a smart lock include: keyless no-touch, touch-screen and/or fingerprint entry. Now this is one of the best ways to make coming home a safe event... not just a Garage Door Opener, but a Smart One! There you are, all secure in your locked car. Then you pull up to your house. Lights turn on, the garage door opens, in you slide, and do not unlock the car door until the garage door is safely locked behind you. What could be safer? Keep all your important papers, cash and valuables safe from fire, flood or theft with a good safe. Return to DIY Home Security System.